Shopping for Doctor Who Prop Replicas? 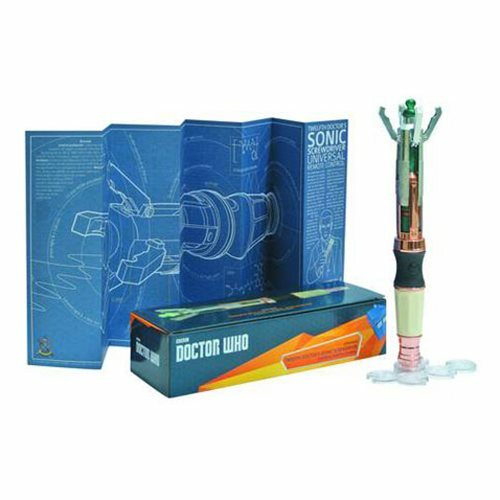 Packed full of technology, this Doctor Who 12th Doctor Sonic Screwdriver Replica Universal Remote is a fully functioning gesture-based remote control. The Doctor Who 12th Doctor Sonic Screwdriver Replica Universal Remote is made from a mix of high-quality materials with real heft provided by its metal construction and the authentic look from the blend of enameled zinc and hand-polished, copper-plated die castings, the ivory-colored handle, with the added depth of its subtle fleck, and the soft, leathery touch of the rubber grip with integral action button. The Wand Company's patented gesture-based remote control technology embedded in the Twelfth Doctor's Sonic Screwdriver allows you to control your stuff just like The Doctor in the TV show. This advanced gesture-based infrared remote is compatible with almost all home entertainment equipment, such as iPod docks, TVs and Blu-ray players. Measures about 8 3/4-inches long x 1 1/4-inches in diameter.